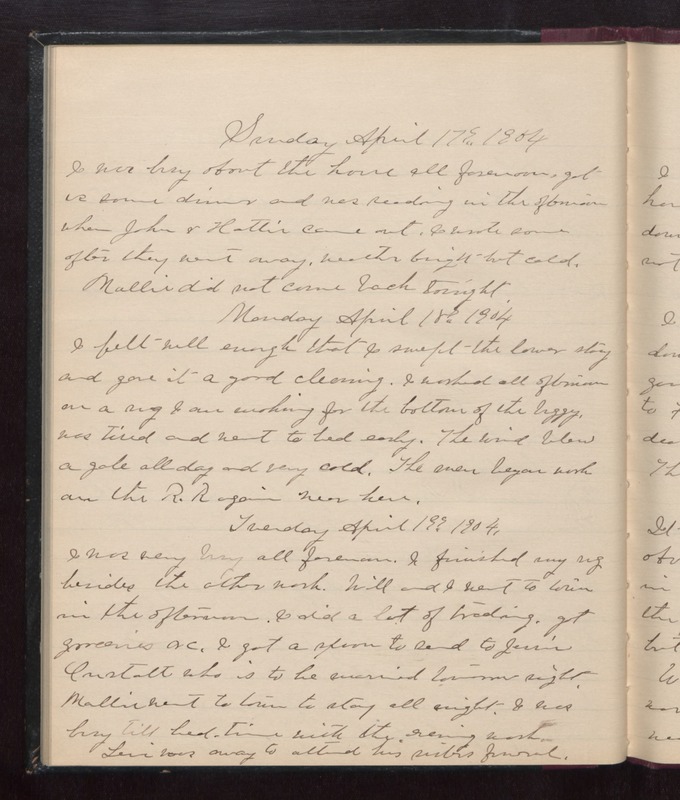 Sunday April 17th 1904 I was busy about the house all forenoon. Got us some dinner an was reading in the afternoon when John & Hattie came out. I wrote some after they went away. weather bright but cold. Mollie did not come back tonight. Monday April 18th 1904 I felt well enough that I swept the lower story and gave it a good cleaning. I worked all afternoon on a rug I am making for the bottom of the buggy. A gale all day and very cold. The men began work on the R.R. again hear here. Tuesday April 19th 1904 I was very busy all forenoon. I finished my rug besides the other work. Will and I went to town in the afternoon. I did a lot of trading. Got groceries, &c. I got a spoon to send to Jennie Oustatt who is to be married tomorrow night. Mollie went to town to stay all night. I was busy till bed-time with the evening work. Levi was away to attend his sister's funeral.